Stable+ is a natural probiotic culture of beneficial micro-organisms including lactic acid and phototropic bacteria and yeasts, grown in molasses water and blended with selected aromatherapy oils and edible vegetable extracts. These are bio dynamically mixed in energised molasses water. We recommend using this product to help balance the microbial levels within your animals housing environment. This results in ensuring they have a healthy living environment with reduced unpleasant odours and fewer insects. Stable+ is a soluble formula applied to the horses’ stable environment, their bedding and their surroundings. No genetically modified micro-organisms are included. This product is applied after the stables have been cleaned and prior to re-introducing horses to their stable. The product is safe to apply around your horse. We would recommend regular intervals of spraying in line with required cleaning and mucking out programmes. Stable+ applied to the bedding as well as the stable housing also assists in the suppression of any harmful micro-organisms that could cause diseases and has shown to help the manure dry quicker making it less odorous. On topping up of bedding we recommend reapplying to new litter or bedding. 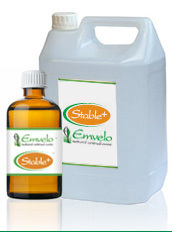 Emvelo Stable+ and Spray+ Concentrates are easy to apply. The quickest and most effective way to apply Emvelo Stable+ Concentrate is by using a pressure sprayer which produces a fine mist. Firstly dilute the product in the sprayer as per the recommended quantities. Then just spray over the stable floor and 1m up the walls as a fine mist. The product should not be applied so wet that it pools on the floor or drips down walls. Once applied, introduce the bedding and again apply a fine mist. The videos below shows Harry Dzenis, the event rider, applying it in his stable. The video below shows a keen young rider demonstrating that it is so simple, safe and easy to apply that children can do it too. Stable+ contains the carrier oil neem, along with other aromatherapy oils, which may help to naturally reduce the number of flies and mites. The product is generally made without use of citronella oil to reduce possibility of allergies to your horses. To assist with moving of horses between premises and to shows we also recommend applying Stable+ to horse floats and transportation vehicles. This helps provide odours for which your horse will become familiar and possibly reduce stress.